26 W INTER 2018 PracticeLink.com L E G A L M AT T E R S PeaceHealth is dedicated to EEO and Affirmative Action for all protected groups, including veterans and the disabled. PeaceHealth careers in Washington, Oregon and Alaska! 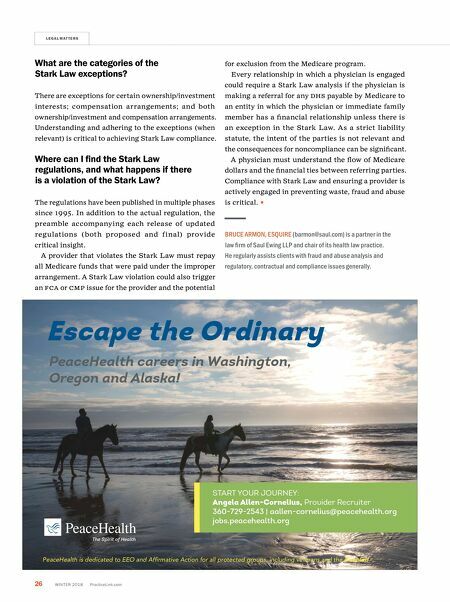 Escape the Ordinary START YOUR JOURNEY: Angela Allen-Cornelius, Provider Recruiter 360-729-2543 | aallen-cornelius@peacehealth.or g jobs.peacehealth.org What are the categories of the Stark Law exceptions? There are exceptions for certain ownership/investment interests; compensation arrangements; and both ownership/investment and compensation arrangements. Understanding and adhering to the exceptions (when relevant) is critical to achieving Stark Law compliance. Where can I find the Stark Law regulations, and what happens if there is a violation of the Stark Law? The regulations have been published in multiple phases since 1995. In addition to the actual regulation, the preamble accompanying each release of updated regulations (both proposed and final) provide critical insight. A provider that violates the Stark Law must repay all Medicare funds that were paid under the improper arrangement. A Stark Law violation could also trigger an FCA o r CMP issue for the provider and the potential for exclusion from the Medicare program. 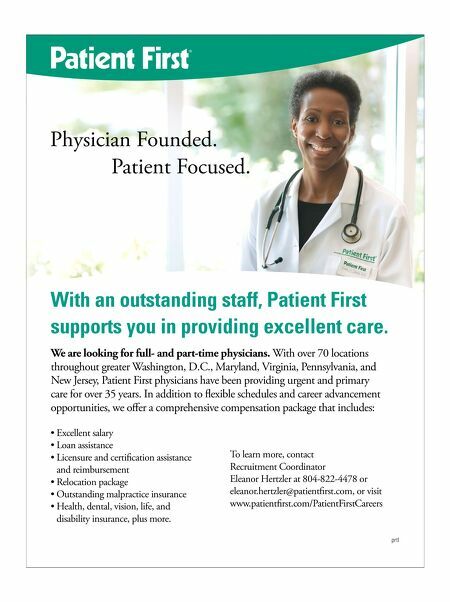 Every relationship in which a physician is engaged could require a Stark Law analysis if the physician is making a referral for any D h S payable by Medicare to an entity in which the physician or immediate family member has a financial relationship unless there is an exception in the Stark Law. As a strict liability statute, the intent of the parties is not relevant and the consequences for noncompliance can be significant. A physician must understand the flow of Medicare dollars and the financial ties between referring parties. Compliance with Stark Law and ensuring a provider is actively engaged in preventing waste, fraud and abuse is critical. BRUCE ARMON, ESQUIRE (barmon@saul.com) is a partner in the law firm of Saul Ewing LLP and chair of its health law practice. He regularly assists clients with fraud and abuse analysis and regulatory, contractual and compliance issues generally.